I’m guessing Price would be more open to an extension; his former pitching coach at Vanderbilt, Derek Johnson, is now the Cubs’ minor-league pitching coordinator. And unlike Samardzija, Price might be willing to accept a few more years of rebuilding to grab the bigger prize — the Cubs’ first World Series title since 1908. Costly? Yes, it would be costly. An extension for Price would be costly, too — I’m thinking at least seven years, $190 million, or slightly above the Justin Verlander and Felix Hernandez deals (Verlander and Hernandez are more accomplished than Price according to ERA-plus, but I’m accounting for inflation in the market and the fact that Price is left-handed). The argument against making such a splash is that the Cubs are nowhere near ready to win. A play for Japanese right-hander Masahiro Tanaka – if he is ever posted – would make more sense given the team’s current state. Tanaka only would cost money, and not as much as Price. The Cubs also could acquire him without giving up prospects, adding to his appeal. Well, other teams covet Tanaka for the same reasons, and the Yankees, in particular, appear in no mood to be outbid. So, the Cubs can’t count on Tanaka. They can’t count on Samardzija. Someone tell me: Where are they going to find an ace? This season doesn’t figure to be any better; the Cubs have hired a new manager, Rick Renteria, but to this point their only major-league additions are catcher George Kottaras and outfielder Justin Ruggiano. A fifth straight losing season seems inevitable. The last time the Cubs had a streak that long was from 1978 to ’83, a span of six straight. Trading Samardzija only will add to the fans’ frustration; the former Notre Dame receiver is immensely popular in Chicago. The addition of Price would be the perfect public-relations counter, and then some. The Cubs would be getting a more accomplished pitcher — and one who, if my theory is correct, would want to stay in Chicago long-term. Theo Epstein, Jed Hoyer and Co. cannot worry about fan unrest; they need to press forward and build smartly for the long-term, knowing that the Cubs will not overtake the Cardinals anytime soon. That said, if you had to bet today, you wouldn’t bet on Samardzija, Tanaka or anyone in the farm system becoming the Cubs’ long-term ace. • Want to know why the Angels are interested in signing Raul Ibanez to be their DH? Check out Ibanez’s career slash line at Angel Stadium: .349/.407/.522 in 327 plate appearances. • The Pirates, Brewers and Astros still need a first baseman, and at least four are available in trade – the Rangers’ Mitch Moreland, Blue Jays’ Adam Lind, Mets’ Ike Davis and Mariners’ Justin Smoak. The Astros could look at the Nationals’ Tyler Moore, who played for ‘Stros manager Bo Porter in Washington when Porter was a coach with the Nationals. • The Rays’ signing of free-agent first baseman James Loney to a three-year, $21 million contract qualified it as a bit of surprise, considering that the team operates under greater financial restraints than most clubs. Well, Loney’s 29.8 percent line-drive rate was the best in the majors last season (though perhaps an aberration; his career rate is 23.6 percent.) His .729 OPS against lefties was a significant improvement over his previous .658 mark. And the Rays, who rely heavily on their own metrics, love his defense, too. 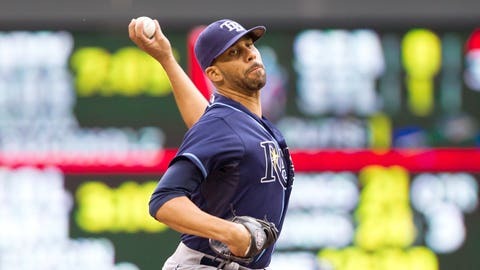 • The Twins maintain interest in free-agent right-hander Bronson Arroyo even after committing a combined $84 million to righties Ricky Nolasco, Phil Hughes and Mike Pelfrey. Then again, the team also could try to upgrade its offense after ranking 13th in the AL in runs last season. The leadoff position remains an area of concern — the Twins were last in the AL with a .286 on-base percentage from that spot. Of course, few leadoff men are available, but ideally the Twins would find a shortstop or outfielder with those types of skills.